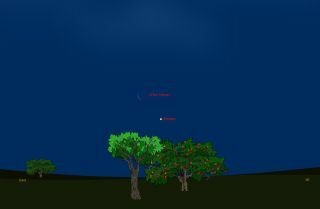 This sky map shows how Venus and the crescent moon will appear just before sunrise on March 31, 2011 as viewed under clear morning conditions. Early-bird skywatchers graced with clear weather tomorrow morning (March 31) will get a celestial treat before sunrise, when Venus and the moon appear together in the east-southeast sky. While not an exceptionally close conjunction, the cosmic event should not disappoint skywatchers. Venus and the moon are the two brightest luminaries of the night sky, and the pair should make for a striking sight in the dawn twilight. Make sure there are no tall obstructions like buildings or trees, since by sunup Venus will only be about 12 degrees above the horizon. Your clenched fist held at arm’s length covers about 10 degrees of the sky, so Venus will only be a little higher than one fist above the horizon at daybreak. The moon will appear a bit above that. This sky map of Venus and the moon shows how they will appear during their March 31 rendezvous. Then again, those who only now might notice Venus probably haven’t been paying much attention to what has been visible in the early morning skyof late. Venus has been putting on a dazzling show in the pre-sunrise eastern sky since November. During December and January, it soared high into the sky and was visible for nearly four hours before sunrise. But from now through the month of April, Venus will linger low in the eastern predawn sky. The brilliant orb will rise like clockwork just over an hour before sunrise, but still can be easily identified as the brightest thing besides the moon. Late in April, Venus will be joined by three other planets – Mercury, Mars and Jupiter. All four planets ultimately will converge in an unusual planetary gathering that will persist through much of May.But more on that next month. Do you plan to photograph Venus and the moon? Do you have skywatching photos you'd like to share with SPACE.com? If so, feel free to send them to managing editor Tariq Malik at: tmalik[at]space[dot]com for potential galleries or stories.